Oh, those crazy birds! What’s not to love? Most smartphone owners have a soft spot for these slightly aggressive birds. In Angry Birds Rio they are begrudgingly kicking off on a new adventure. A nasty gang of animal traders trap our bewinged friends and smuggle them to Rio—but Angry Birds won’t just sit – or fly – there and take it! They decide to make a run – or flight – for it—and they decide to take Blu and Jewel (the stars of the upcoming movie “Rio”) as well as a whole bunch of other animals with them. 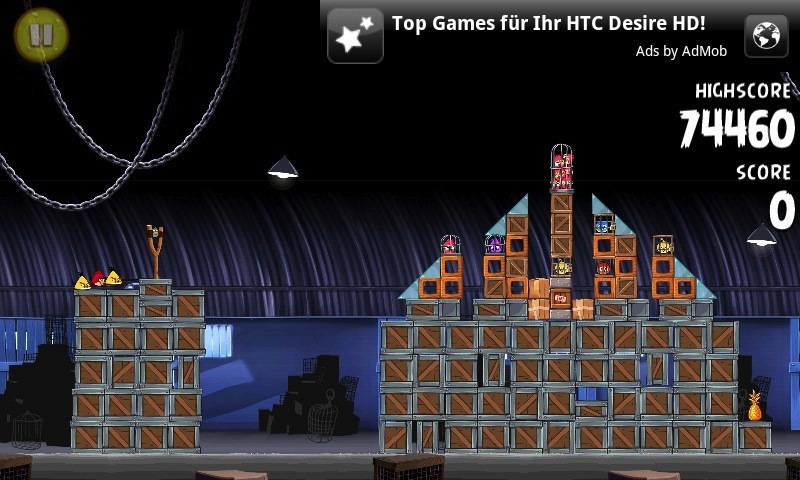 As a successor to the hugely popular “Angry Birds”, this app has some pretty big shoes to fill. Angry Birds broke records on almost all platforms and in most countries. The Rovio developers have come up with a very clever concept: they’ve partnered up with 20th Century Fox, a production company that will shortly be releasing “Rio”, an adventure movie that stars two birds, Blu and Jewel. Angry Birds Rio is a big hit from a marketing point of view, as 10 million downloads within 10 days can testify! But just how good is the game, really? Angry Bird Rio has a lot to live up to: the first part enjoyed an extrodinary amount of success and was/is lots of fun to play. The gameplay has remained true to the original concept; if it ain’t broke, why fix it, right? The goal is to catapult the Angry Birds at different targets using a slingshot. Obstacles must be overcome and the laws of physics applied intelligently. The targets have changed: instead of pigs we are now aiming at cages, monkeys and so on. There are also hidden objects such as golden pineapples, bananas and other little treats. 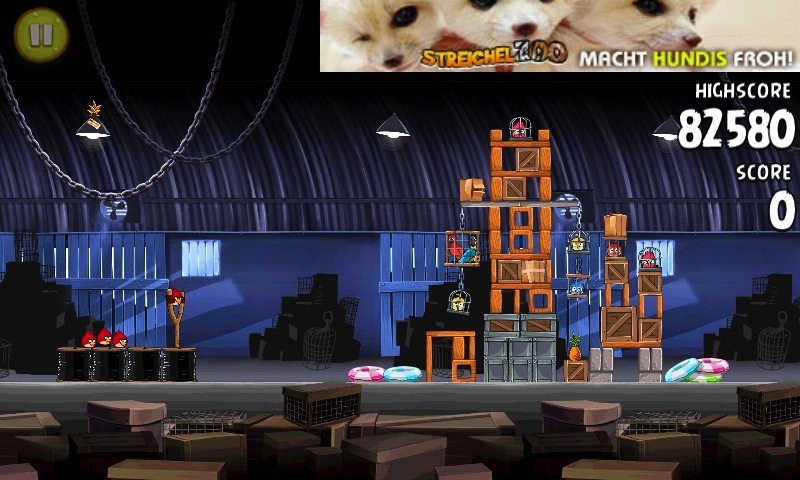 The first few levels are fairly easy, though the hidden objects can be somewhat tricky. In each level, a lamp must be made to swing in order to uncover the golden pineapple. Brilliant idea! Gathering points and thus stars becomes increasingly difficult. Those who strive to obtain all three stars really have to show dedication and drive. Angry Birds Rio come with 60 levels (originally there was talk of 45). There’s talk of updates in May, July, October and November, 30 levels per update. Angry Birds Rio is quite simply good fun. We loved the original gameplay and are glad to see that it hasn’t changed much, but that fun new elements and gimmicks have been added. The story line is more captivating thanks to the upcoming movie. A must-have for Angry Birds fans! The Rovio developers have done a wonderful job: Angry Birds Rio’s graphics have really been improved. As you can see in the screenshots, the design is very nice indeed; we especially like the attention to detail (swinging lamps, palm tree leaves, etc.). The sound effects are also good fun—the birds, monkeys and other elements all make noises that add to the game’s charm. The only thing I couldn’t quite get the hang of were controls for the white bird that shoots the eggs. I had the impression that his reactions are time-delayed, and sometimes he doesn’t react at all. I can’t say whether this comes down to my own clumsiness or else a small glitch in programming, which is why I’m not knocking any points off. 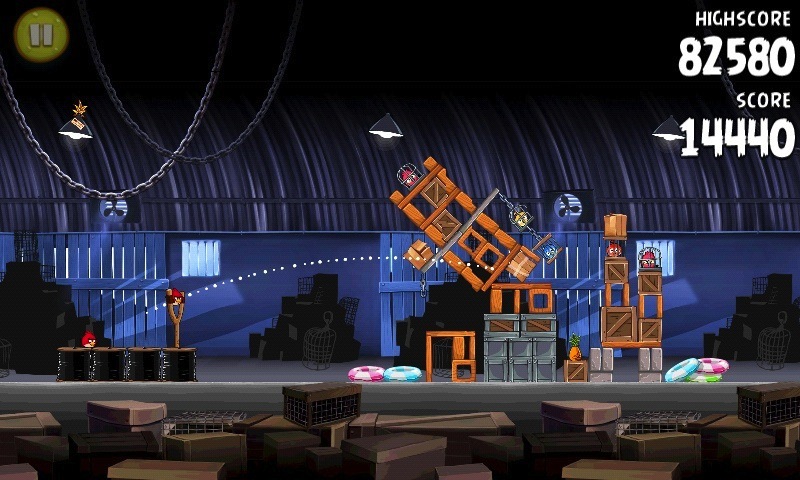 Angry Birds Rio is a completely new world from a visual point of view. Whatever details were missing in Angry Birds can now be found in Angry Birds Rio. Diving into this world is lots of fun, thanks to the gameplay, storyline, graphics and soundtrack and sound effects. Controls haven’t changed and are very good (aside from when trying to get the white bird to react!) . 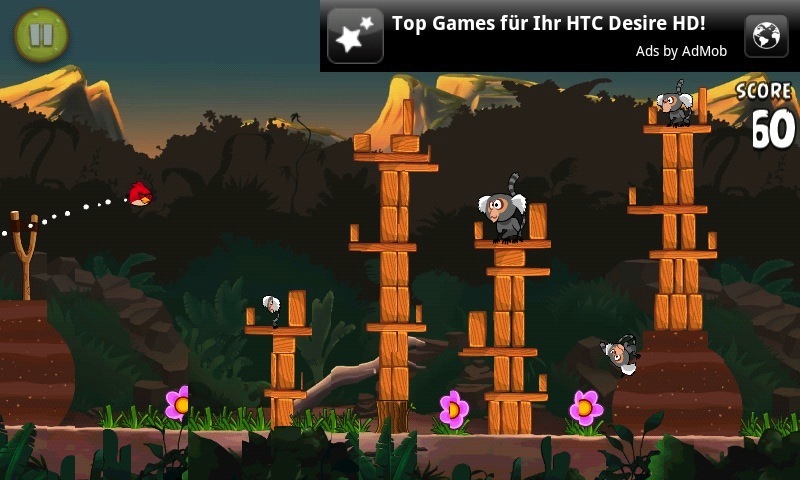 Angry Birds Rio performed well on the Desire, Desire HD and Notion Ink Adam. The app’s speed was excellent and there were no crashes—I tested it out over several hours. 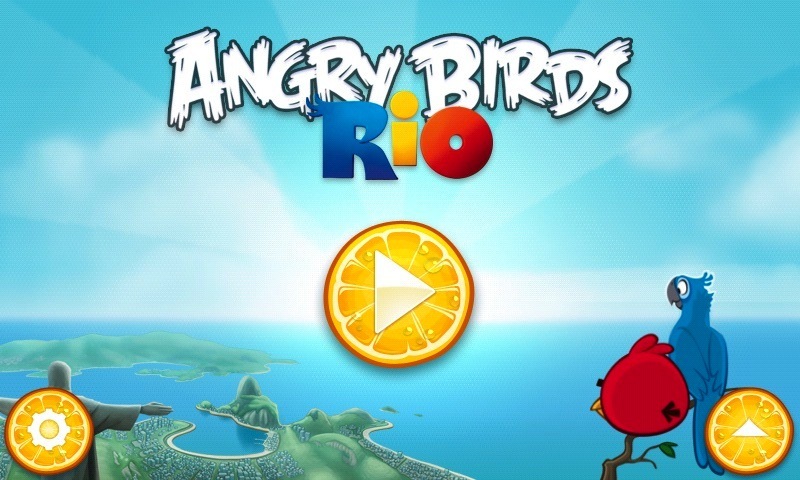 Angry Birds Rio can be downloaded for free from the Android Market. Despite hooking up with 20th Century Fox there’s a super annoying ad banner. Boo! why can I never get a link to.Market from here?